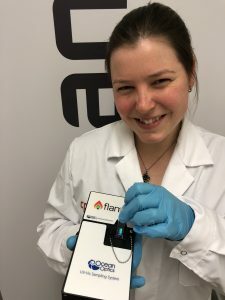 We just got a new Ocean Optics Flame spectrophotometer specifically optimized for the NanoCuvette™ One. The instrument has improved resolution in the wavelength interval where it is most important, while maintaining a measurement time of just a few seconds. Together with Ocean Optics, we are currently testing how much better results can be achieved when the instrument is optimized specifically for the NanoCuvette™ One application. We are very excited about these new possibilities.